We had a perfect time and came home well relaxed, although had to leave a day early as ferry was cancelled because of a storm, and we had to reschedule. The house was perfect and I loved your design touches - the colours, the curtains and the crockery - everything really! It was such a pleasure to go out and come back to the place ,to look out at the tide going in and out and the sunsets. We would love to hear about your other place when its finished could you let us know? Here are the words I put on trip advisor - mostly though its difficult to put into words - just perfect! 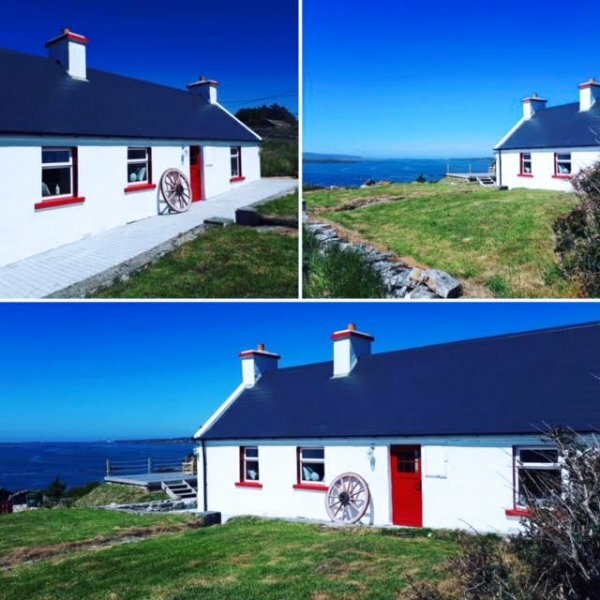 We have had holiday rentals for years in the West of Ireland, but have to say that this house and the friendliness of the people was outstanding. A perfect house for relaxing and unwinding, with the best taste in interior design and a well equipped kitchen. Everything spotlessly clean and bright but cosy even on a rainy day. Thank you for the lovely welcome and we hope to visit again soon. I tried to explain, that this was the best cottage ever and you have done a fantastic work. We do hope, we can return. Maybe not next year, but for sure, we want to return. We stayed unfortunately only 7 nights at this fantastic home. We have seen pictures of it before, but when we got there, we were overwhelmed by the beauty of the location and also the setting. Natasha has furnished the whole house with so much love to the last details, it just looked like in a magazine for My Perfect Home. Still, we felt at home right away and even with our three children (3, 8, 9), we never felt like they are not allowed to touch anything, like one feels sometimes when you stay at a perfect styled place. We just felt like at home! The kitchen provides everything needed to cook whatever you want to, the living room is cosy as it can be, the view out of the window just incredible, the bedrooms are lovely furnished. Last but not least: Sharon made as feel comfortable at once. She waited for us in Dungloe, showed us the way to the cottage, she made us feel very welcomed although we were late. We do wish we could have stayed longer, and if possible somehow, we‘ll return for sure! We were met by Sharon who could not do enough for us, giving us lots of useful information on the local area and welcoming us with homemade scones and flowers. The house is stunning, beautiful views of the bay and view point to look out for seals and watch the oyster men catching oysters. Thank you Natasha for the privilege of staying at the Sea House. Our top places were Maghery beach, The Strand Bar Maghery (very friendly local pub with the added addition of donkeys across from them that kept our 6 year old amused), Music Festival in Dungloe. Look forward to going back soon! We stayed at the Sea House in July with our two young children. We received a warm welcome which included fresh flowers around the cottage, two baskets full of turf for the open fires and homemade scones! 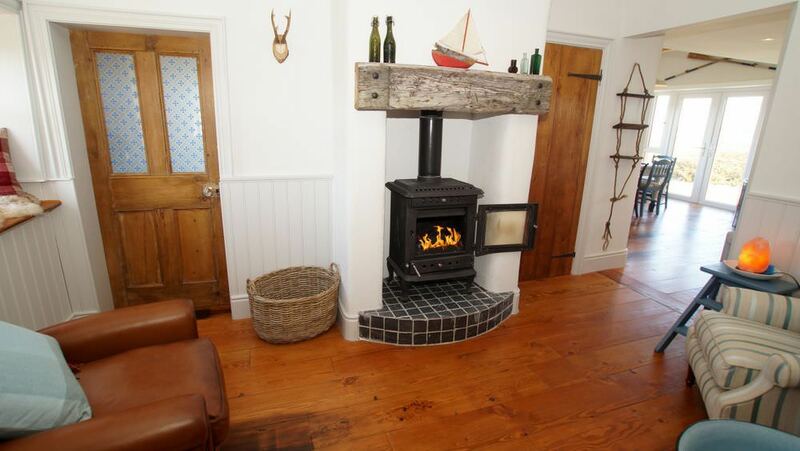 The Sea Cottage is finished to an extremely high standard with lots of attention to detail. Because good weather on Irish holidays is never guaranteed we like to have a really nice indoor space to hang out in if needs be and the Sea Cottage was perfect for lazy days. 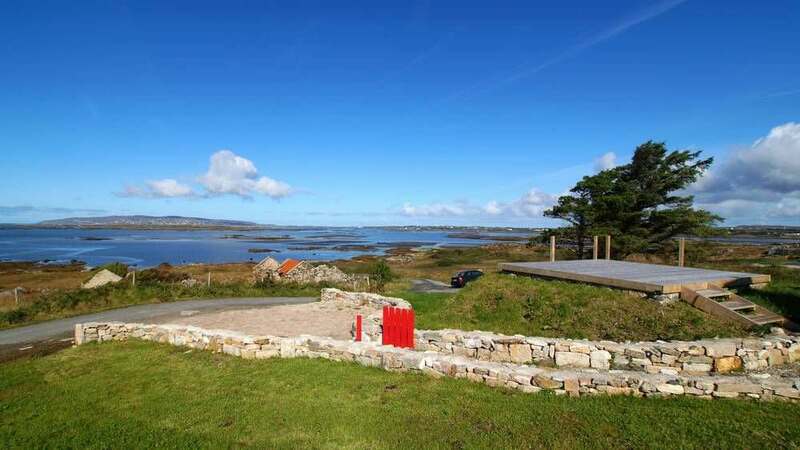 There is lots to do in the surrounding areas including Glenveagh National Park, Fintown Railway, Ards Forest Park and a boat trip to nearby Arranmore Island. In Dungloe itself there were lots of places to experience traditional Irish music which we really enjoyed. 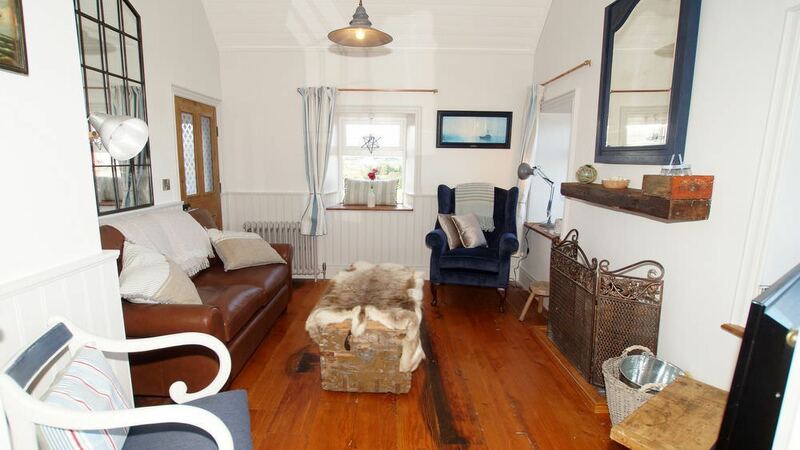 This is a very beautiful holiday cottage which I would have no problem recommending. Dear Natasha, thank you for a wonderful stay at the Sea House. I have seldom stayed in a holiday home which has been so comfortable. It really was like a home from home. The house is absolutely spotless, adorably decorated and wonderfully situated, with a magnificent sea view. The four of us had a lovely five days exploring this corner of Ireland which is absolutely amazing. So many sandy beaches , beautiful mountains and very friendly people. Many thanks as well to Sharon, who does a wonderful job greeting the guests and making us feel very welcome. Just to say how much we enjoyed our stay. Brilliant sunsets every evening! And like others have said just to look through the window is amazing. Seals, herons and hares! Beautiful cottage and very well equipped. Dear Natasha Wow i mean just wow! 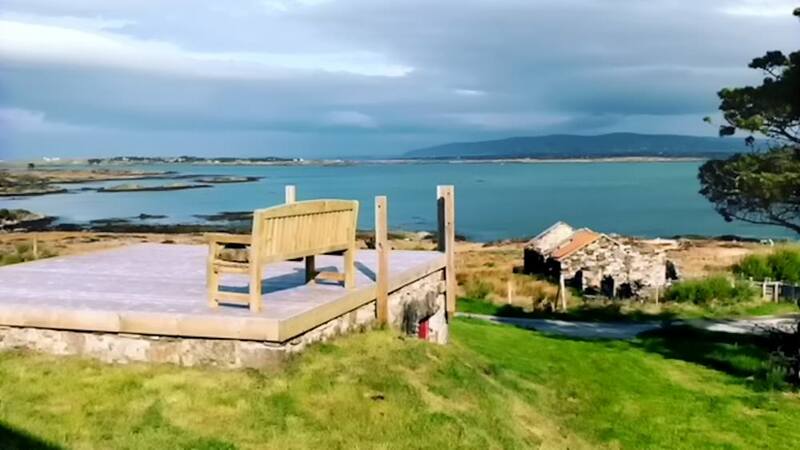 The six star sea house has first class attention to detail and talk about location location spot on a gem of a place to unwind after a day walking the delightful Donegal coast. Looking through the window of life is spellbinding. The cuckoo said good morning every day the seals fished happily and the fishermen turned their oyster beds underneath a faithful irish sunshine and her Atlantic breeze. We loved the cottage, that's where I would like to spend more time... big windows overlooking the sea, we didn't miss one sunset, always different from one day to another. The house is clean, refurbished with taste, you feel at home straightaway... the scones on the table were ready to be eaten upon our arrival, what a lovely gesture. Bunches of flowers around the house was the little touch I loved the most. You just feel like taking your shoes off, light the fire and relax in one of the comfy sofa or armchairs. We really liked the location of the cottage as well, nearly in the middle of nowhere, yet not completely on your own...the little town of Dunloe has everything you need for your shopping. We went for long walks in the wild just meeting sheep and hairy cows... lovely time spent with my husband and my 10 year old daughter. I will keep this address, I already sent it to my friends. Again, thank you very much for the lovely place, we really enjoyed it. My husband and I have just had the privilege of spending one week at Natasha’s gorgeous cottage. Right from the very start all was setting the tone for s wonderful week. We arrived at the cottage ,which was easy to find, and met by Shona who showed us around and gave us all the informative information we needed. To our surprise we arrived to warm scones and jam in the table and basics such as tea and milky supplied to make our settling in easy. The cottage is superbly equipped with sooooo much attention to detail. It truly felt like home from home. Could not think of s single item that was missing. Very comfortable! At first we thought ‘how could we visit all we wanted to as we would miss out on the wonderful ambiance this cottage has to offer. Wifi was fast , the lovely cosy fire places ,the great views from every window showing a different aspect of this very quiet part but yet only 5 min drive to Dungloe town which had great restaurants (seafood very good )and music entertainment (high quality ) over the weekend. But be warned if only starts at 22 30. There was so much to do and see in the area. We managed to drive 1500km and walk 60 km in the week. A trip to Donegal airport and Fanad head is worth the drive. 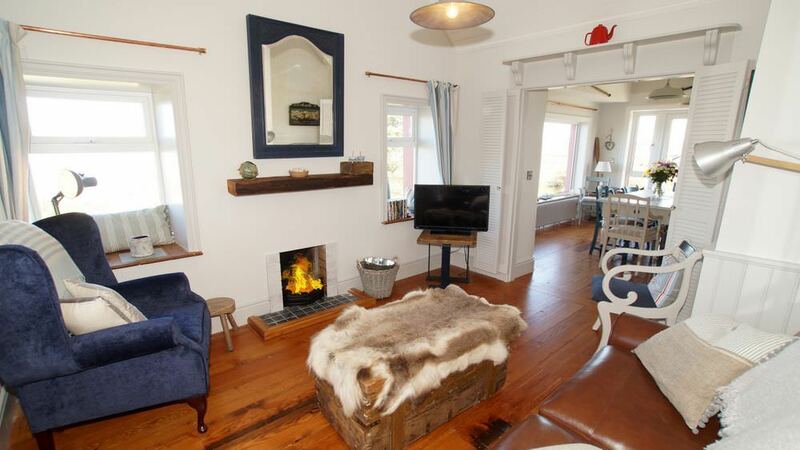 But spending time in the Sea House on the deck or in the cosy lounges relaxing..... is a great option too. 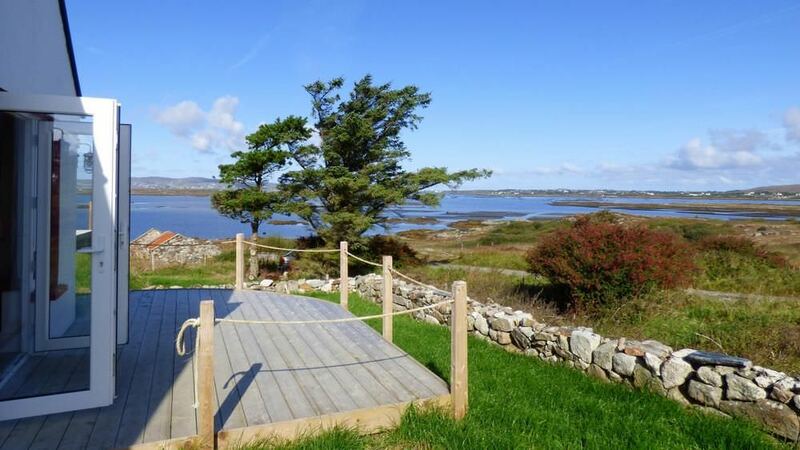 All in all you will not regret escaping to Natasha’s gem in this beautiful part of Ireland. Sorry for the delay in getting this to you. At last we have found our haven in Dungloe. The SeaHouse is just perfect! We have been visiting Dungloe for 15 years and just love it and the surrounding area. Unfortunately the cottage we used to rent is no longer available and we have kept searching over the last 5 years for somewhere as nice and all that we wanted. Finally we found the Seahouse which we now like even more! The cottage is beautiful, quirky, cosy and so much thought has been put into the decoration and layout. 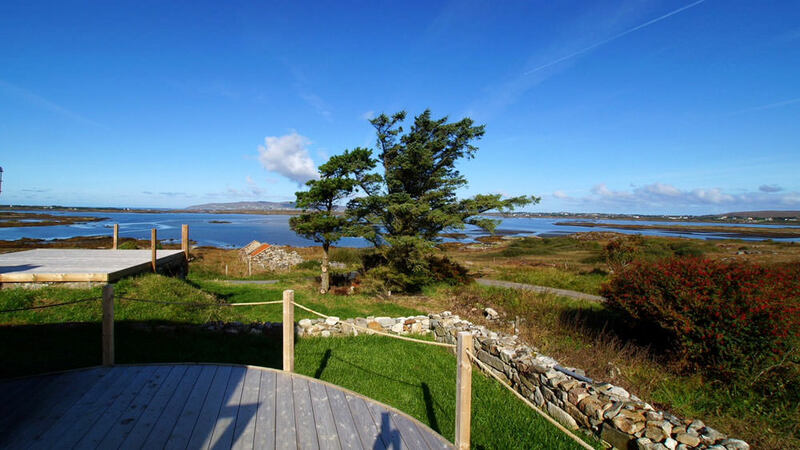 The views are gorgeous over Dungloe Bay and over to Aranmore Island. So cosy for a lie in, lazy breakfast then going out exploring and stopping in for a couple of Guinness in Patrick Johnny Sallys or Beedys bar in Dungloe. We also love The Strand Bar in Maghery which is also close. Our favourite time of the day though was getting back to the cottage early evening lighting the fire and candles and having a lovely meal and wine with our favourite music in the background. Sitting by the cosy fire was just perfect. There is also a wood burning fire in the other room off the kitchen, no TV in that part so you can chill out with a book and enjoy the silence. We booked the house very easily online and Natasha was extremely helpful. Sharon who looks after the cottage was also so helpful and kind and nothing was too much bother. We cannot wait to return to the Seahouse and are counting down the days.